“I was exploring an antique shop when I ran across a fabulous 20 volume set of turn of the century children’s books. They were called “Chatterbox” and were published yearly in England. What fascinated me was the physical condition of each book. They had the wear and tear of books that were over a hundred years old but they still had their illustrations in good shape. I loved the cracks, chips and patina of their covers and I knew then that I had to include them in a painting. I had been sketching out a painting of my granddaughters Annika and Alice playing hide and seek. They hid over and over in the same place, under the dining room table. 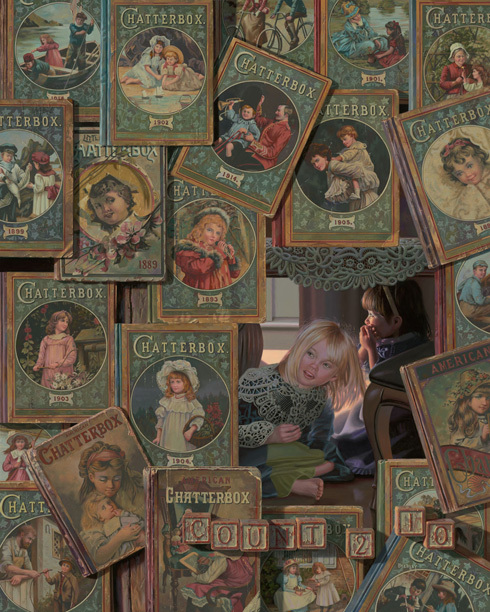 I combined the “Chatterbox” books and the girls and came up with the painting “Hide and Seek”.